2018 Gold Black Bull coins are supplied in brand new, uncirculated condition. Halfway there!! The 5th release in The Royal Mint’s Queen’s Beasts Collection is the Black Bull of Clarence. The Black Bull of Clarence is a symbol of power and might, and is associated with the rise of the House of York during the fifteenth century. It is believed that Edward IV’s army bore the bull on their shields in his victorious battle of 1461 after which he became the first Yorkist king of England. The first appearance of the bull on the Royal Arms and on coins is thought to originate from the 1560s when Elizabeth I ordered the recoinage of all silver coins. 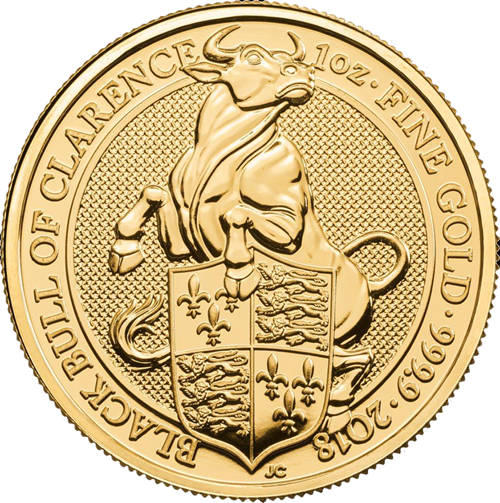 2018 1oz 24k Gold UK Queen's Beast 'Black Bull of Clarence' has been added to your shopping cart!